This setup will save you data (really handy if you have limited data plan). Depending what site you visit, it can be up to 30% of your data (yes, I saw this). 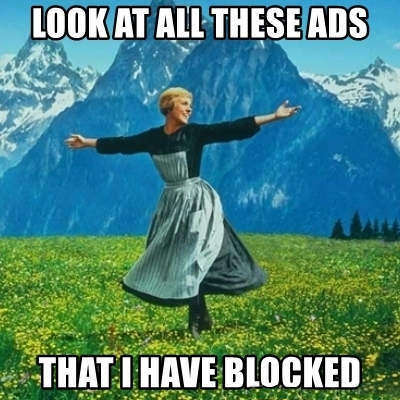 This all started rather innocent (just like all horrid stuff do start) with simple ad-blocker in browser. BTW, if you want to stop reading, now is the time and I recommend Firefox browser with holy trinity of uBlock Origin, Privacy Badger and Decentraleyes – this should be good enough for all non-geek people. Viber ads go rogue (autoplaying, cannot stop it) from Branko Kokanovic on Vimeo. So, that was last drop. Turns out, I was not the only one with this problem and searching internet, people were recommending to put “ads.viber.com” to hosts file, so that it points to 127.0.0.1. This way, any request going to ads.viber.com will be resolved to local address and effectively blocked. But you all knew that already. (Besides getting rid of Viber) I started toying around with /etc/hosts file, but that was not that pleasant experience and (from my experience) Windows is choking on large /etc/hosts file, so I wasn’t long on this setup. For the sake of completeness, here is excellent starting point to craft your own hosts file, if you are into that. This is when I found out about Pi-hole – this is one of the best pieces of software ever created (not the idea, but whole execution). Pi-hole is complex software with simple idea – point your DNS to it and it will resolve all domains of ads and trackers as 127.0.0.1 and you will never even start a request with them. Installation and upgrade and usage – everything with it is just so smooth and everything “just works”. I don’t often donate money to free software, but in this case, I opened my wallet. 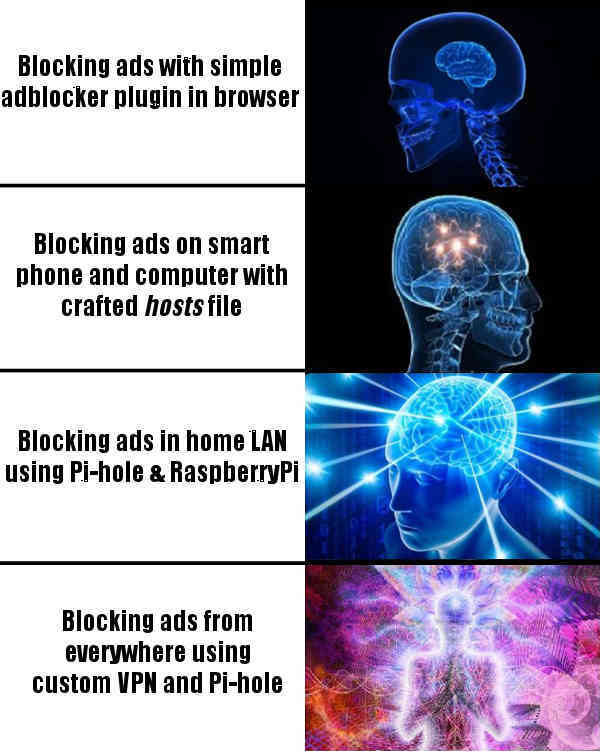 And so I loaded Pi-hole to my Raspberry Pi and suddenly everyone in whole household (local LAN network) started benefiting from blocked ads and trackers. Life was good again. Except…when I was outside of home and it wasn’t. That being said, if you want ultimate setup, please read mentioned blog, as it will use best practices, including WireGuard, socks5 and whatsnot, and will surely be more secure than my Frankenstein. Hack, even Pi-hole itself have nice explanation to integrate it in VPN. But if you just want to dip a toe and don’t care about world-class security, here is 5 minute guide (no, really, it is literally 5 minutes to set this up). First you will need one machine with some newer Ubuntu (I have 18.04 LTS) – it can be any cloud VM or local machine, as long as you can open UDP port on it for whole world. This is port where VPN will listen. Any cloud provider will do, and any VM size will do. Do note that all your traffic will go through this machine, so check network pricing for your provider. Alternatively, this can all be done in your home, on Raspberry Pi, but watch out your upload speed (mine is extremely slow), as your download speed while roaming will be bound by your upload speed at home. If you don’t want your traffic to go through this VM (or through your home), this is nice way to fix it, but this is outside of the scope of this tutorial. Accept all default values, nothing special here. For upstream DNS providers, you can put Cloudflare’s 1.1.1.1 and 1.0.0.1, but you can also use Google ones – 8.8.8.8, or OpenDNS at 208.67.222.222. When asked for address of DNS server, provide “127.0.0.1” (this is where Pi-hole is). Second DNS can be either empty, or provide some existing one, I generally use “1.1.1.1”. You can accept all defaults for other values, nothing special here. and restart Pi-hole with sudo service pihole-FTL restart. Give some recognizable name (I use “<person>-<device>” naming scheme). You can use version with password (omit nopass), but I generally find it really sub-optimal to type password whenever I want to connect (it might be once every couple of days, but still…). After this step, you will get your profile in ovpns directory. Download it to device where you will use it and that’s it. OpenVPN client is generally available for all platforms, so you can download it for Windows, Linux, Android (even from F-Droid), iPhone…Just load .ovpn file in client and you will connect. If you don’t have web port open to access Pi-hole web interface from outside (which I recommend), you can use pi.hole as URI to access it when you are in VPN. Now, visit https://firebog.net and pick lists you want blocked. Paste them in “Settings”->”Blocklists”. Each time you fire “pivpn add nopass“, you will generate new profile. You can share this profile with whomever you want, but beware that they will also use same traffic as you and also, you are now in position to see what sites they visit – you should not abuse their trust on this. That’s it, enjoy your new setup!